There are three kinds of sitting postures: forward, upright, and reclined. Each posture needs a different kind of support. The right way to sit at a computer is different from the right way to sit for driving or writing at a desk. Reclined sitting postures are used for resting, conversation, and other activities with the eyes focused forward or upward. 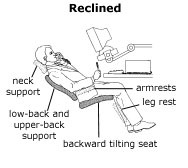 Most people recline to watch TV, and some recline to drive or use a computer. Upright sitting postures are used for working with the hands close to the body and the eyes focused straight ahead. Most people sit upright to type and eat, and some sit upright to drive or use a computer. 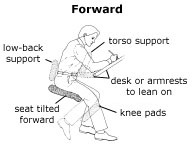 Forward sitting postures are used for reaching tasks and tasks with the eyes focused downward. Writing, drafting, dentistry, and using a microscope usually require forward postures. Forward sitting requires the knees to be positioned below the level of the hips, while reclined sitting requires the knees to be positioned above the level of the hips. 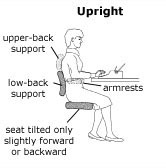 The seat tilt range in a conventional chair, therefore limits the position of the thighs relative to the torso and dictates the tasks that the chair can support. A "free-float" seat tilt adjusts automatically with your shifting body weight, like a rocking chair. Some task chairs have a free-floating seat that tilts in responds to changes in your body position with different tasks. However, the tilt-tension in these seats is often too stiff for very light people and too loose for heavier people. Saddle seats offer a clear advantage for forward tasks that require forward reaching, fine hand-eye coordination, pushing and pulling, and scooting about. In saddle seats, the feet are better positioned to support the body than in a conventional chair. A good chair for an upright or reclined task may be ineffective or harmful if used for a forward task and vice versa.